Gloriæ Dei Cantores and Elements Theatre Company will present Ralph Vaughan Williams’s opera, The Pilgrim’s Progress, fully and hugely staged. For the first time in 12 years, since these forces presented the New England Premiere of the work in 2005, the production is returning here. Sponsored in part by the Vaughan Williams Charitable Trust of London, The Pilgrim’s Progress is the featured event of an international symposium commemorating the 500th Anniversary of the Protestant Reformation. The show runs October 27th & 28th, and November 3rd & 4th at 7:30PM at the stunning and acoustically rich sanctuary of the Church of the Transfiguration, Orleans. 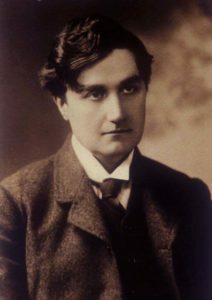 Vaughan Williams’s worked on the opera over 45 years. According to conductor Jim Jordan, “It’s the ultimate expression of the wide variety of his musical style, exhibiting fabulous transparency of orchestration and a luminous sound. 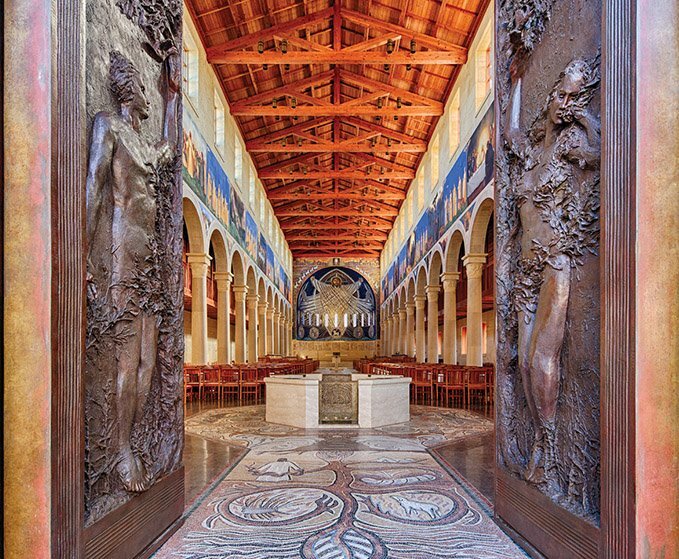 It will come to life amidst frescoes, mosaics, bronze, glasswork, and stone carvings depicting the story of human salvation from Genesis to Revelation. Replete with a 40-person main cast, a 60-person chorus, and a full orchestra—almost a one-to-one ratio with the audience seating, it also requires almost 300 original costumes and thousands of rehearsal hours.” The opera is set against abstract projections and cutting-edge theater technology designed by Michael Counts, Inc. The main cast includes highly acclaimed artists including Richard K. Pugsley, Andrew Nolen, Paul Scholten, Eleni Calenos, Martha Guth, Kathryn Leemhuis, Aaron Sheehan, and John Orduña. FLE: You say that “Vaughan Williams, an admitted agnostic, changed the main character’s name from “Christian” to “Pilgrim” so that the central message encompassed all faiths.” Why is it apt for Luther’s 500th birthday considering that Luther, not a man to embrace people of all faiths, also had perhaps less to do with the Reformation in the Church of England than others? Wasn’t Wesley the man for that? JJ: Perhaps some historical context may be helpful here. October 31, 2017 marks 500 years from the day that Martin Luther presented his famous Ninety-five theses—points of argument in theology and church practice—nailing them to the door of All Saints’ Church in Wittenberg where he taught in the university. It was this public act that sparked what has come to be known as the Reformation. The Wesley brothers actually came much, much later, in the 18thcentury, long after the Church in England had undergone the reforms of the 16thcentury. And though the English Reformation had its own particular origins, the teachings of Luther and other Reformers on the continent were widely known and highly influential throughout that period. Vaughan Williams presented himself as a “Christian agnostic.” The term itself is paradoxical, which, like the nature of his religious convictions, remains a bit of a mystery. Nevertheless, his life’s work on behalf of the Church of England is evidence of his deep commitment to the use of high quality music and sacred texts, both for worship and on the concert stage. Like Luther, Vaughan Williams believed that music had both moral as well as aesthetic consequences. You may remember that in his preface to a massive collection of music for worship, Luther wrote that, “next to the Word of God, the noble art of music is the greatest treasure in the world.” Vaughan Williams’s music, wedded to one of the most familiar written products of Protestant Christianity—Bunyan’s “The Pilgrim’s Progress”—makes the opera a wonderfully apt expression of faith for observing this 500th anniversary of the Reformation. That quote seems almost to contradict itself. Please elaborate. Just as Vaughan Williams changed the protagonists’ name from the original “Christian” to “Pilgrim”, broadening his character into a type of “Everyman” archetype, his instructions to put a “morality” onto the public stage (albeit with all of the musical and theatrical components needed for an opera) continues that same vision, making this tale of transformation available to a much wider and varied audience. Is the complicated “allegorical” nature of the Bunyan simplified into dramatic interactions that we can follow? The libretto and music are combined in traditional operatic fashion with allegory translated into an extraordinary structure that comes to life through various solos, duets, trios and quartets as well as large choruses, all married together through a fabulous combination of lighting, video projections and staging. There are forty singers not including the chorus. How do we keep them straight? How many people onstage altogether including chorus and orchestra? All told between soloists, chorus and orchestra, there are as many as 130 people, at certain moments, on stage. The opera is being performed in the entire sanctuary and nave area of the Church of the Transfiguration. Tell us about the scenery and props and costumes. The scenery is being created with projections designed by S. Katy Tucker and Michael Counts Inc. based out of New York. This team also produced The Ouroboros Trilogy in Boston last year. There will be props, and almost 300 costumes total. Where will the orchestra be seated? It’s a rather unique set-up – two levels of players in the north side aisle of the church located behind a scrim wall. Is there a part for the magnificent Skinner organ? Delighted that you remembered this fantastic instrument. Vaughan Williams did not actually compose any part for the organ so it will remain silent for this production. Does the opera sound anything like any of Vaughan William’s more familiar works such as his hymns, Songs of Travel or his Serenade to Music? Listeners will hear reminiscences of VW’s famous Tallis Fantasia (in the gorgeous string writing) as well as his well-known Symphony #5 (1943) where he incorporated themes from the opera. Tell us about your collaborators, the Elements Theater Company. Elements Theatre Company was founded in 1993 and is directed by Sr. Danielle Dwyer. The company performs year-round at Paraclete House and the Church of the Transfiguration on Cape Cod in Orleans, MA. They tour nationally and internationally, performing and leading workshops and discussions at theaters, conferences, schools, and religious organizations. Sr. Danielle is the director of this production as well, aiding in the process of combining the multiple disciplines of theater, story telling, music, and voice, into a cohesive production of “The Pilgrim’s Progress” opera. This has been a wonderful exchange between members of Elements Theatre Company and Gloriæ Dei Cantores as they share aspects of their disciplines with one another, creating a wonderful collaborative experience for all members involved. GDC’s recent recording of Rachmaninoff’s “All-Night Vigil” has garnered extensive critical acclaim and last Fall, the choir presented concerts of the Mozart “Requiem” and Britten’s “The Company of Heaven”—a rarely heard masterpiece. A rich trove of information is HERE.